England will be looking to make it two wins from two Euro 2020 qualifying games when they take on Montenegro at the Podrgorica City Stadium on Monday night. 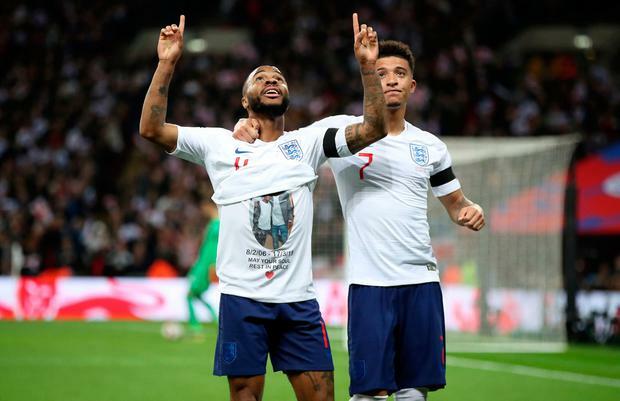 The Three Lions made the perfect start to their qualifying campaign after thrashing the Czech Republic 5-0 at Wembley on Friday night with Manchester City forward Raheem Sterling bagging a hat-trick. Gareth Soutgate’s side will now head to Montenegro looking to build on that performance and come home with another three points to boost England’s hopes of qualifying for the Euro 2020 finals. Montenegro kicked their qualifying campaign off with a solid 1-1 draw with Bulgaria so boss Ljubisa Tumbakovic will be hoping to pull off a shock by picking up a positive result against England tomorrow night. There is no Arsenal representation in the England squad as Danny Welbeck is still out with a broken ankle while Rob Holding – who could have been pushing for a place if fit – is out with a knee injury. Southgate may decide to freshen things up with the likes of Declan Rice, Keiran Trippier, Ross Barkley and Callum Hudson-Odoi all pushing for starts. Tottenham’s Eric Dier won’t feature after picking up a knock against the Czech Republic but Jadon Sancho is expected to keep his place in attack after an impressive outing on Friday. Aleksandar Boljevic could come in for Montenegro but otherwise Tumbakovic could stick with the side that drew in Bulgaria. A quick look at the latest Euro 2020 odds shows us that England are the 7/1 third favourites to win the competition outright so it’s no surprise they are fully expected to pick up all three points tomorrow night. England are 2/5 to win with Montenegro 17/2 – despite being the home team – while the draw is on offer at 7/2. Montenegro will be desperate to put on a show in front of their home fans but I can’t see past anything other than a routine England win. My prediction is 3-0 which can be backed at odds of 15/2 while. England -2 goals is available at 7/2 on the handicap market which looks very tempting. I also fancy Sterling to continue his form in front of goal and 9/2 on the Man City man to score first looks good odds. If we add Sterling to score first in an England win we get odds of 6/1 – which would be my bet for this game.